This popular and attractive beach resort, internationally known, has a large number of places to visit in any season. Uruguay has many hot spring resorts, which have swimming pools of various temperatures. They provide a wide range of services: hotels, sports facilities, nursery and restaurants for your best stay. 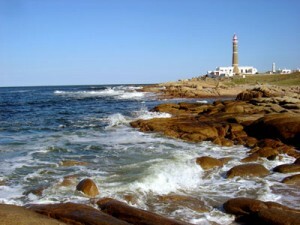 Cabo Polonio is located in the area of Valizas (Rocha Department). The general appearance is that of a sandy strip of uneven width, which has about 35 kms. long or so, for about 5 to 7 kms. wide. It consists of a dune system that can exceed 30 meters in height and are aligned in the direction of prevailing wind. This dune system is unique in Uruguay and is one of the few areas of coastal dunes of America. 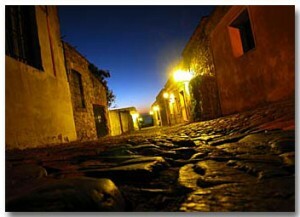 The City of Colonia del Sacramento retains the charm and beauty of its colonial architecture. It has been recognized by UNESCO as World Heritage and it is the only distinction of this kind that Uruguay possesses. Colonia del Sacramento is a current testimony of all time of the Conquest, where the streets and stones tell of invasions, battles, looting, and more than a love story. Visiting Colonia del Sacramento produces a continuous range of emotions that make us feel their houses, courtyards, cisterns, churches, ruins, until the evening arrives and the color of the river begins to darken. The field of Uruguay has a unique form of tourism in the world because it includes ranches, farms and dairies. The fields of Uruguay are located in the heart of Nature. A peaceful and friendly nature. Huge fields, herds of cattle, wild horses, purest streams. The countryside of the Uruguay has got home-nineteenth century, where tradition and peace of the past are kept magically. Tourism is very important in Uruguay and in its capital, Montevideo. Montevideo has a wide offering that includes historical tours, nightclubs, beaches, and agricultural tourism (tourist Estancias, wineries and farms) in the suburbs. Most of the tourists that receive Uruguay are from Argentina, Brazil and Europe, and the number of visitors from the rest of Latin America and the United States is growing every year thanks to growing international airlines arriving at Carrasco International Airport and luxury cruises at the port of Montevideo.